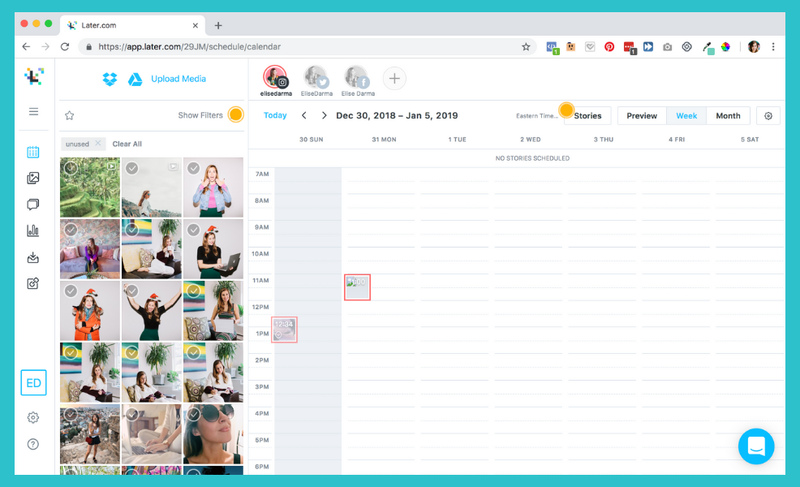 Business owners, freelancers and agency owners: your Instagram scheduling is about to get a whole lot easier. You can now schedule Instagram Stories in advance with Later. Yep, you read that right. I’m not talking about scheduling the posts in your feed, but your actual Stories. This is huge for any business that’s embraced the power of storytelling and connecting with their audience through Instagram Stories. It’s also massive news for anyone running multiple Instagram accounts. When it comes to managing a handful of Instagram accounts inside my agency, I’ve always been a big fan of scheduling posts in advance. In fact, it’s essential to keep all the client accounts running happily. So when Later approached me to be an early beta tester of their new Story scheduling feature, I jumped at the chance. I’m a HUGE fan of scheduling my Instagram posts from my desktop – so this new feature is one more reason to not be hunched over my phone. From the Later desktop app, I can pre-schedule all the images, videos, captions and links for my upcoming Stories. And then when it’s time to post, my phone receives all the content and all I have to do is hit publish. If you know me and have been to this blog before, then you’ll already know I’m a believer in the magical powers of Instagram Stories and how they grow my business, drive traffic to my website, and how hosting a Stories takeover is truly a win-win situation for all involved. Instagram Stories is where the party’s at in 2019. Check out the blog posts I linked above that cover why Instagram Stories are indispensable to my business and then come back to finish reading this article. Instagram Stories are The Spot™ where brands and businesses get raw and authentic with their followers, where real relationships and trust are formed, and where you can finally get 1:1 face time and eager engagement with your followers. Now that we’re on the same page about Instagram Stories, let’s get down to business and talk scheduling. In this blog post, we’re going to cover how to schedule Instagram Stories and my own personal findings from using the feature as an early beta tester. As business owners, we often get overwhelmed by the multi-layered world of social media. There are just so many social channels, and each channel needs its own strategy, its own content plan, its own engagement — it almost seems never ending, doesn’t it? This is what I would look like 24/7 if I didn’t have apps like Later helping me handle all of my many social media accounts. That’s why I’m so hyped about Instagram Stories scheduling. Instagram Stories scheduling means we can take even more time off of unplanned Instagramming and make the time that we do spend inside Instagram more productive. The point of using Instagram for your business is not to spend 3 to 4 hours a day inside the app, checking up on comments, posting fresh Stories, cranking out fluffy posts, and getting caught up on what others are doing. The point of using Instagram for your business is to make your life EASY… to make finding new clients and customers easy, and to make your Stories and feed sell FOR you — regardless of how long you spend in the app each day. Instagram Stories scheduling takes us one step closer to this. Drive more traffic to our websites, products, services, videos, courses, or anything else that we sell through more consistent, planned and strategized Story posting! Let’s get to the how behind it all! 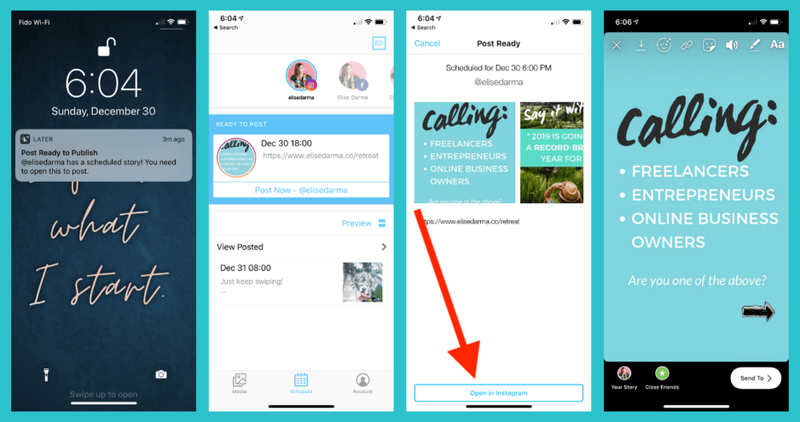 Instagram Stories scheduling is a brand new feature from Later that allows us to pre-schedule our Instagram Stories in advance, using their scheduling app (available on desktop and mobile). Here’s how it works in the Later web app. Open up the Later desktop app. If you don’t have an account with Later yet, head here to set up your account. Click the Stories button on the top right of your Calendar view. Upload your images or videos to the Media Library, and drag your media items (AKA whichever graphics you want to post to your Stories) to the Timeline. By the way, scheduled Stories can be dragged to a different time once saved, as well! Hot Tip: Later just published a blog post on the best times to publish content on Instagram for 2019 based off of 12 million posts! Check it out and schedule your stuff accordingly to ensure views and clicks galore. At this time, publishing is available via mobile push notifications only. Make sure you have iOS 5.3.6 and above or Android 5.6.2 and above in order to publish using the Later mobile app. When the scheduled time comes, you’ll get a push notification from Later to your phone; all you have to do then is click it open, let Later guide you to Instagram and then publish your Stories! Here’s what that looks like, step by step. Once you get the push notification, just click on it to open up Later, and follow Later’s link to Instagram to publish your Stories! And there it is: your Instagram Story gets published for your followers to see. You have successfully scheduled and posted your first Story on Instagram! So thanks to the lovely people at Later, I was asked to be an early beta tester for this Story scheduling feature. I decided to take this new feature for a test drive and play with it over the holiday break. Not sure about you, but for me, the holidays can get super hectic with so many family events, so much good food to eat, and so many cute dogs to pet. I knew I wanted to be present and enjoy my holiday break, and I definitely didn’t want to be on Instagram all day. With the help of my team who created some cool Story graphics for my Bali retreat, I went into my Later scheduling app, added the Story graphics and the swipe up links, and scheduled them out for the week over the holidays. Over the holidays, I was able to kick back on the couch, chill and not stress about my IG Story game. Later told me when and what to publish… and Holiday-Elise (who’s mostly thinking about food and family, and yes, in that order) was very grateful to Instagram Stories scheduling, to say the least. Is scheduling your Instagram Stories worthwhile? Does it save you time? Any time I got a notification from Later, all I had to do was head on over to the Instagram app and hit publish. Easy peasy. That’s a total win in my books. Want to nab yourself this feature from Later and make your Instagram Stories more effective? Join Later on any paid plan and grab it for yourself! Play with it, test it out, and report back to me your own findings on whether you like it and whether you’ve noticed any differences in your Stories analytics!